Heart and Sole: W is for Which Way? 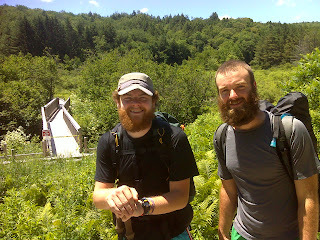 I got up this morning, hiked a mile from US 4 to Maine Junction where the AT and LT part company, and then headed east. That's because the AT is now headed for New Hampshire, while the LT heads on north to Canada. OK, simple enough. I was going east on the northbound AT. Then I read a sign saying that this was a relocation. For more than 0.8 miles the current AT *northbound* follows the route of the former AT *southbound*. Say what? I was going east. 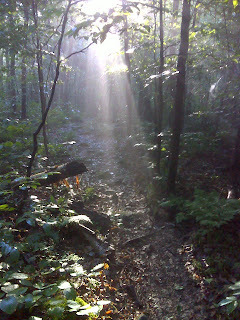 The morning sun was there, streaming its God-rays before me. I had no doubt of my direction. But now the compass needle in my brain was spinning like a top. Which way was I *really* going???? THANK GOODNESS I had to hike this confused piece of trail both ways. Problem solved. I was going east and west and north and south and the devil take it. Let powers mightier than me figure out Which Way I was going and When. Okay ... things settled down and I headed on up the trail and got a good view of Killington summit - here shown in a telephoto shot. If I couldn't get the view from up there, at least I could get the view the other way. Which Way is better? Well, duh! Let's just say that I wish I was up there today. On I went through Gifford Woods State Park and past a short trail relocation around a washed out footbridge at the Kent Pond Access parking area. No big deal. I really didn't care Which Way I went as long as I got to see Kent Pond. 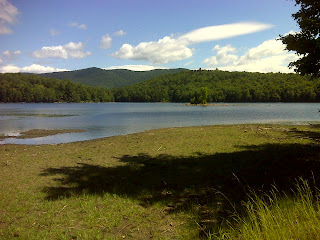 But that was the second Irene-caused Vermont relocation I had hit, and before the day ended I hit the third. It begins to seem like half of Vermont is closed! Beyond Kent Pond you hike an easy mile and a half to Thundering Falls Road. There the guidebook says the trail heads down past the falls and then out across the Ottauquechee River floodplain on a handicapped-accessible boardwalk that took 30 years to complete and was opened in 2007. But the posted signs said it was closed now, and they've changed all the white blazes to blue on the approaches. Furthermore, I went down to the falls and was astounded to find that there was NO water in the fall - even that is closed! Apparently an electric power generating plant diverts all the water most of the time. Then I checked the boardwalk and found that Irene had indeed sent it all kattywompus off its moorings. Yet reliable sources (a local lady and a pair of especially delightful thru-hikers - 'Pretzel' and J.C.) all told me they had crossed the floodplain with no problem. 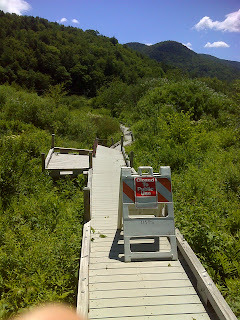 The sections where the boardwalk was missing were dry and firm. Which Way should I go - the official white blazed reroute, or the very special stretch of not-to-be-missed boardwalk? In the end I did both. Problem solved once again. I ended the day climbing up from River Road to a summit near Quimby Peak. 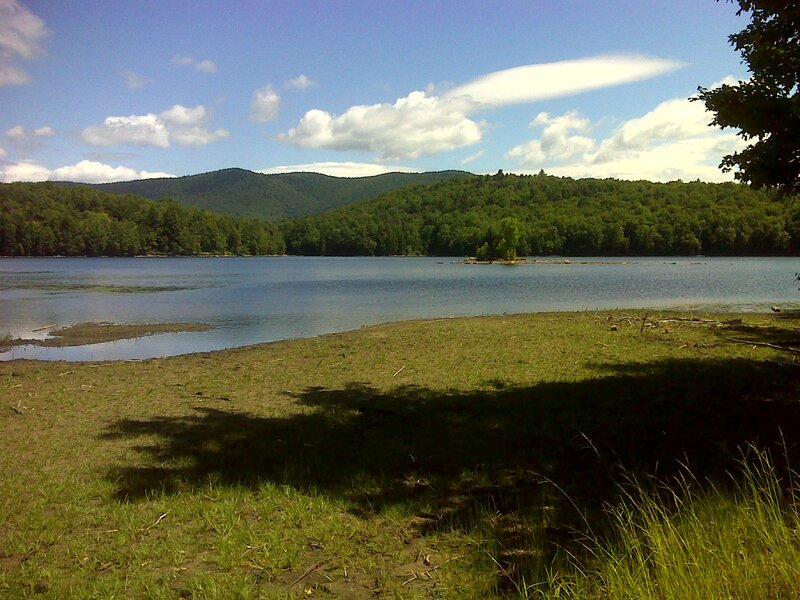 It was getting hot, but I found myself just marveling at the beauty and seclusion of these Vermont woods. Frankly, it matters not Which Way the trail goes. It can hardly avoid sampling the magic of the Wilderness. And W, at the end of the day, stands for Wilderness.